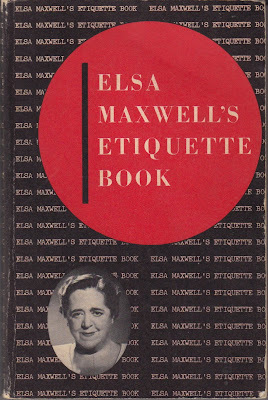 Elsa Maxwell was quite the party girl. She not only attended a plethora of parties, but she gave as good as she got. It is no wonder that in the course of her travels, she picked up a thing or two about etiquette. We have shared some of Maxwell's tips in a previous post, but there is still so much to learn. After amassing all that knowledge, she would write it down in book form so we can all be schooled in the style of the fabulous Elsa Maxwell. Good manners spring from just one thing – kind impulses. A gentleman always stands when he is introduced to a man or a woman. A gentleman always stands when a woman enters a room unless he is in a public place and the woman is a stranger. The act of rising to the feet is one of charming deference, one of the last vestiges of chivalry left in our hurried, modern world. Never be afraid to say “I don’t know.” None of us, happily, are supposed to be omniscient. Do not top anyone’s story. Once upon a time, before electricity or gaslight, a dinner party required one candle at least for every person present. Today candles are used only because they make a table festive and flatter the ladies – either reason being quite sufficient to use them. Once again, it is hard, even in this day and age, to top Elsa as the "Hostess with the Mostess." Here's to kind impulses.